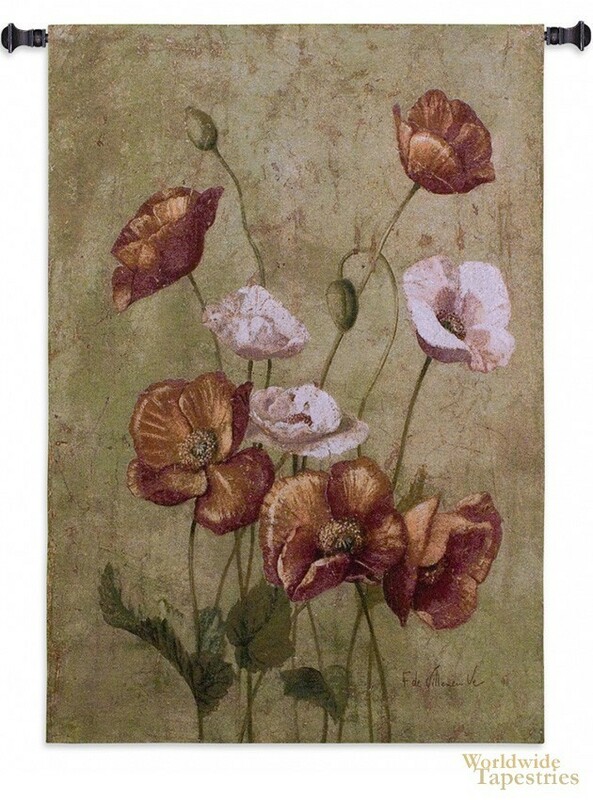 Based on the artwork of Fabrice de Villeneuve, this tapestry "Fleur Rouges" shows floating red and pale poppies. Born in Lille, France, de Villeneuve's work has been inspired form his surroundings of flora and natural beauty. Idyllic in nature, and yet rooted in the traditions of 17th century floral artists, this work is an example of his equal attention to dtail of the petals and stamens of each flower, and portraying a feeling of romanticism and idealism at the same time. The French romanticism and study of botanical details is typical of his works involving petals and flowers. This tapestry "Fleur Rouges" is backed with a lining and has a tunnel for easy hanging. Note: tapestry rod and tassels, where pictured, are purchased separately. Dimensions: W 38" x H 53"